If you are exporting a motor vehicle from the U.S. to another country, they may require certification data for your motor vehicle. A Certificate of Conformity and Certificate Summary Information (or summary sheet data) will contain the emission standards the motor vehicle was certified to. To request or find a Certificate of Conformity or Certificate Summary Information sheet, you need to know the Test Group number (for light-duty cars and trucks – model year 2001 or later) or the Engine Family number (for pre-2001 light-duty cars and trucks). 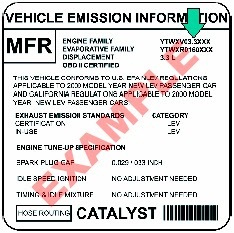 This information is listed on the “Vehicle Emission Information” label/sticker located under the vehicle’s hood. The number has 11 characters using both numbers and letters. If your vehicle is missing the emission label you may be able to order a new one from your U.S. dealer or you can contact the manufacturer directly for the Test Group number for your particular vehicle. Certificates of Conformity and Certificate Summary Information sheets are available on EPA’s Web site for model years 2003 and later. Go to http://iaspub.epa.gov/otaqpub/pubadvsearch.jsp (the Advanced Search page). Skip the “Keyword Search”, “Engine Displacement", "Number of Cylinders", “Emission Control System”, and “Document Date on and after” fields. Type in the Test Group or Engine Family number.